The Bro Flight Finale had a lot in common with its Pro neighbor: wind, upsets, and some big games. MADISON – While many eyes were on the Pro Flight Finale in Minneapolis, there were several important games being played at its sister tournament, the Bro Flight Finale. 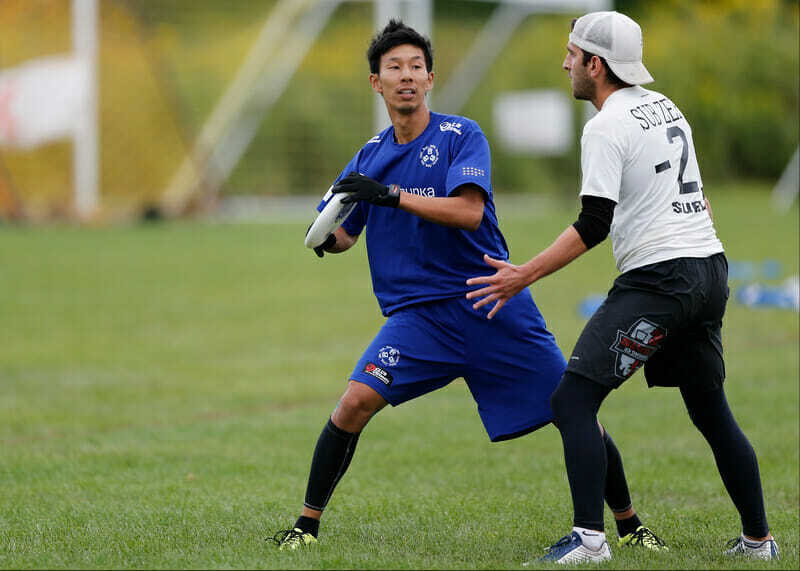 The wind turned out to be the best defender of the weekend, but that didn’t stop Japan’s Bunka Shutter Buzz Bullets from going undefeated and triumphing over Minneapolis Sub Zero 9-7 in the final. The final match at BFF had a light-hearted vibe from both teams – the Buzz Bullets were competing in the United States, undefeated in the tournament, and sitting with a win over Sub Zero from earlier in the tournament. Sub Zero, on the other side of the field, had nothing to lose; the result of this game did not affect their USAU rankings, they had a second opportunity to play a top-rated international team, and they too were undefeated against US-based teams. Minneapolis was the first team to ride the initial high of the final game, scoring the first offensive point and breaking in the second point to go up 2-0. Sub’s person defense was suffocating, forcing the Bullets to attempt tight windows and fail to complete easy passes. After the turnover, Sub Zero took advantage of their height mismatches by shooting deep and setting themselves up for an easy end zone drill for a score. But the wind had a different idea in mind. Sub Zero continued to try the long ball, but the throws came up short or sailed. Furusawa Takanori matched up against Simon Montague to slow down the resets and forced high stall punts downfield. The Bullets adjusted their strategy and tried a poachy junk look that converted a break and gave them their first lead of the game at 6-5. They broke again to take half 7-5 on a fantastic upwind huck from Katsunori Tanaka. Buzz rode out that lead in the second half to the tournament title. Buzz Bullets came to the tournament for tough competition, as they were not able to attend the US Open due to scheduling conflicts. From the moment they stepped on the field, the Bullets were all smiles — clearly excited to be facing off against some of the best the US had to offer. Their razor sharp throws allowed them to easily slice through the 20 mph winds, and opposing defenses struggled to stop the high side movement. Meanwhile, Sub Zero came to BFF looking to continue to build upon their season. While the results may not have skewed heavily in their favor earlier in season, the Snowmen were continually making improvements to their offensive sets, defensive intensity, and developing their rookie class. “Now that everyone is bought in, and we are running our sets a little better, it feels like everything is coming together, which is good!” said captain Simon Montague. Sub Zero was full strength headed into the weekend, but lost Nick Stuart due to a (potential) concussion in the final match against Buzz Bullets. It’s worth noting that Sub Zero had the easiest schedule in route to the final with their two strongest matches being Buzz Bullets and Doublewide. They did not have to face off against Florida United, Patrol, or Madison Club, the third, fourth, and fifth place finishers, respectively, at this tournament. Sub’s performance earned the North Central an additional bid, bringing the total to three after Kansas City Prairie Fire hung on by the skin of their teeth (0.34 points over bubble team Santa Barbara Condors). The first round of Saturday ended with two monumental wins from Patrol and Florida United against Madison Club and Doublewide, respectively. Philadelphia Patrol looked dominant against Madison Club early in the game, leaving the Mad Men with their heads hanging low and looking defeated after each point. However, that was not the end of the story. Madison Club went on a three break scoring streak to bring it to double game point, but the Philly Patrol were able to regroup on offense and win the game. Patrol’s weekend was a roller coaster; they notched wins against Florida United and Madison Club, but lost handily to Doublewide, Boost FC, and finally Florida United in the third place game. Patrol’s game was very simple: work hard, master offensive sets, and grind on defense — vintage Philly ultimate. With big layout plays from Michal Panna, Matt Esser, and stifling handler defense from Jimmy Zuraw, Patrol generated break opportunities and often earned them. It will be interesting to see which of their losses could be converted to wins if played in better conditions where their likelihood for offensive turnovers would decrease. Florida United made a positive statement for the Southeast, despite Atlanta Chain Lightning’s poor performance at the Pro Flight Finale. Florida United was missing a good chunk of its height and star-power, including Michael Hickson, Jeremy Langdon, Ultiworld’s 2015 runner-up Breakout college player Stuart Little, and 2015 College POTY Chris LaRocque. However, Florida United was able to defeat Doublewide, converting five of their 10 break chances against a (nearly) full strength Austin squad. Their other notable wins include Pittsburgh Temper and a revenge win against Philly Patrol in consolation. Madison Club was a question mark going into BFF, as they had previously landed some good wins against teams like Sub Zero, but also had some notable losses, including High Five and Machine. Colin Camp, Brian Hart, and Kevin Brown lead their team to a double game point win over Doublewide to close out the tournament. Doublewide has yet to live up to the expectations that followed them early in the season. With a stacked veteran roster including Kurt Gibson, Ethan Pollack, Kiran Thomas, and Brandon “Muffin” Malecek and young guns Dalton Smith, Will Driscoll, Chase Cunningham, and Mike Ogren, you would think an under .500 performance would seem shocking. But that’s just what happened. The Austin team went 3-4 with losses to Florida United, Sub Zero, and a DGP loss to Madison Club, just after winning on double game point in the round prior. The Austin Doublewide roster has yet to be complete at either a tournament or a practice. Tim Gehret will not play with the team until Regionals. While Kurt Gibson did play this past weekend after missing a few weeks with an injury, other members of the team were injured or missing including Purcell, Michael Cramer, Dan Emmons, Max Cook, Ryan Bigley, Zach Riggins, and Kevin Richardson. “We had 15 healthy bodies and were grinding all the way until the end in really tough conditions. That is something to be proud of,” said Purcell. While they may not look like a contender for the title, they should not be counted out just yet. If they can get healthy — and build chemistry — they certainly have the personnel to threaten in the postseason. Pittsburgh Temper was perhaps the biggest disappointment of the weekend with losses to Madison Club, Boost FC, Florida United, and a ground-shaking loss to Sub Zero after being ahead 12-7 and giving up five straight breaks to lose on double game point. With their backs against the wall, they crumbled. Without defensive stalwart and deep threat Tyler Degirolamo and key offensive handler Pat Earles, Temper was able to secure only one victory against a weak San Diego Streetgang. “The results did matter, but now they don’t. Now it is just about doing as well as we can at Regionals and taking a bid we didn’t earn to Nationals,” said captain Tad Wissel. Temper struggled to be consistent on either side of the disc. Their offense was struggling to get open and, when it did, the easy catch would end up on the ground or out of bounds. Pittsburgh had more than one chance to end the game against Sub Zero and secure a win, but had two deep shots soar out of bounds. On defense, Temper attempted to force many teams into the deep space hoping for the wind to swirl the disc in their favor. However, many of their opponents took this opportunity and were able to capitalize on the large poaches underneath their receivers. Boost FC, Streetgang, and Boston Garuda were fearless and had little to lose. While the traditionally machine-operated Pittsburgh and Doublewide struggled to run their sets in the wind, the lower-level teams were looking to take deep shots, hit open blade opportunities, and generate turnovers from gritty person defense. While they were able to put up points on the board, they just weren’t at the level of the upper tier teams at the tournament. Eryn Ogren is the Business Development Manager for Ultiworld. You can reach her by email (eryn@ultiworld.com) or Twitter (@iveyeryn). Comments on "Bro Flight Finale 2015: Tournament Recap"